Now Is a Great Time to Be a Dividend Investor. Really. Today is an excellent time to be a dividend investor. Many quality blue chips offer yields of 2% or more, yields that greatly exceed the interest rates on money market accounts, savings accounts, or certificates of deposit. And companies are boosting those dividends, with many quality firms raising their dividends 10% or more on an annual basis. Perhaps most importantly, dividend-paying stocks typically are less volatile than non dividend payers, something that is not lost on investors weary from the volatile markets of recent years. The bottom line is that when you consider their bargain-basement prices and high dividend yields, dividend-paying stocks are as attractive today as they have been in nearly three decades. But how do you find these opportunities? If you want the recipe for getting rich in the stock market, here it is: Find stocks with above-average appreciation potential and safe and growing dividends, and buy them at attractive prices. My book, The Little Book of BIG DIVIDENDS (John Wiley & Sons), along with this Web site, shows you how to do just that. My book is a blueprint for successful dividend investing. In the book, I walk you through the basics—what a dividend is (and isn’t); why, how, and when companies pay dividends; and why some companies pay big dividends while others pay no dividends at all. 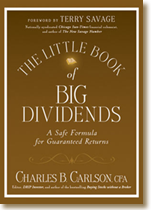 Order The Little Book of Big Dividends here. I also discuss the importance of size and safety of dividends when considering dividend-paying stocks, and I provide you with a simple yet powerful formula for finding Big, Safe Dividends (BSDs). This formula takes into account factors most critical to the safety and growth potential of a company’s dividend. As a companion to the book, I have created this Web site www.BigSafeDividends.com. On this site, you’ll find up-to-date BSD (Big, Safe Dividend) scores, Quadrix® ratings, dividend and yield information, dividend-payment schedules, and other relevant dividend data on every dividend-paying stock in the Standard & Poor’s 1500 Index. The site provides literally a one-stop shop for all things dividends and is a powerful tool for researching dividend-paying stocks. And by the way, all the information is provided free of charge. Finding dividend-paying stocks that will make you rich may not be as easy as shooting fish in a barrel, but the big opportunities are out there. By purchasing my book, and using this Web site, you have upped your chances dramatically of finding them.